Editor’s Note: Our “Mobile PMP” section in the June issue (p. 88) featured Michael Rolman’s description of the myriad ways his company, Environmental Pest Service (EPS), keeps its employees safe while on the road. Rolman’s additional thoughts on the subject appear below. Distracted driving is quickly becoming a primary cause of auto accidents in the service industry. For that reason, EPS is installing a mobile application that combats distracted driving on company phones used by our approximately 400 salespeople, technicians, service managers and branch managers. Essentially, the app disables the phone when the vehicle is traveling more than 10 mph. The phone will still receive calls, voicemails and texts, but it will not ring or signal alerts. The phone is also unable to make outgoing calls, other than to 911. The only feature of the phone that will work is the GPS app, and only if it was set before the vehicle starts moving. At EPS, all phones come to our headquarters, where we add them to our Mobile Device Management system, install the app, get the phones set up for the users, and deliver them to the team. Our app partner then conducts in-person or remote training for anyone who needs help understanding how to use the phone with the app. The good news is, on the market are many apps that combat distracted driving, and anyone can download them. This means even the smallest pest management companies can take advantage of this technology to improve safety. 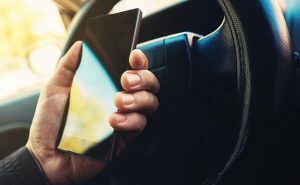 Should your company decide to install a mobile app to combat distracted driving, don’t forget to set policies that address what happens if an employee doesn’t follow the rules. For instance, what are the consequences if an employee deletes the app from his phone, or uses his personal phone while driving instead? Setting new rules won’t make much of a difference if they aren’t followed, so clearly communicate to your team what happens if they don’t comply.